A new way to edit text on iOS using gestures on the keyboard to move the cursor and select text. Swipe to move the cursor. Swipe from the shift (or delete) keys to select text. 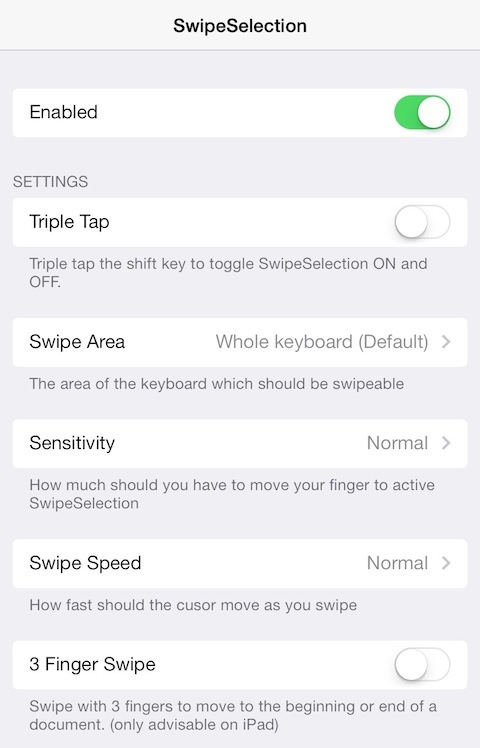 The Pro version has been rewritten for iOS 7 & includes a selection of settings to customise SwipeSelection to your typing style. Adjust the swipe sensitivity, cursor speed and which portion of the keyboard should be swipeable; as well as the ability to toggle some other features. No icon will be added to the homescreen, all options can be found in the settings app itself.